The Beauty Closet's Top Innovative Skincare Pick for Spring 2019: Lumene Vale Beauty Drops! Check out LUMENE’s video story here! CYCLOPENTASILOXANE, DIMETHICONE CROSSPOLYMER, DIMETHICONE, ASCORBIC ACID, METHYL METHACRYLATE/GLYCOL DIMETHACRYLATE CROSSPOLYMER, C12-15 ALKYL BENZOATE, RUBUS CHAMAEMORUS (CLOUDBERRY) SEED OIL, VACCINIUM VITIS-IDAEA (LINGONBERRY) SEED OIL, BHT, SOLANUM LYCOPERSICUM (TOMATO) EXTRACT, BUTYLPHENYL METHYLPROPIONAL, CITRAL, CITRONELLOL, GERANIOL, HYDROXYISOHEXYL 3-CYCLOHEXENE CARBOXALDEHYDE, LIMONENE, LINALOOL, PARFUM (FRAGRANCE). ﻿Let me start out by saying that I’m often weary about moisturizing products in general as I have breakout-prone skin and sometimes those products combined with a Vitamin C formula can really cause irritation and not much else to boot! Luckily for me though, I’d done thorough research on the brand and what they’re about so I had a pretty strong hunch that I was safe to give this one a try and I’m very glad that I did! For starters, this awesome product can be snagged from Target- in addition to a variety of Lumene’s other fabulous skincare products, for under $25 and for such a quality skincare item this is a real steal :) You get around a month’s supply of capsules in a glass glass jar; each capsule is packed with good-for-you-ingredients like Vitamin C and Wild Arctic Cloudberry extract to leave the skin super smooth & ultra radiant instantly…plus, your skin looks & feels healthier & more vibrant daily- with every use! 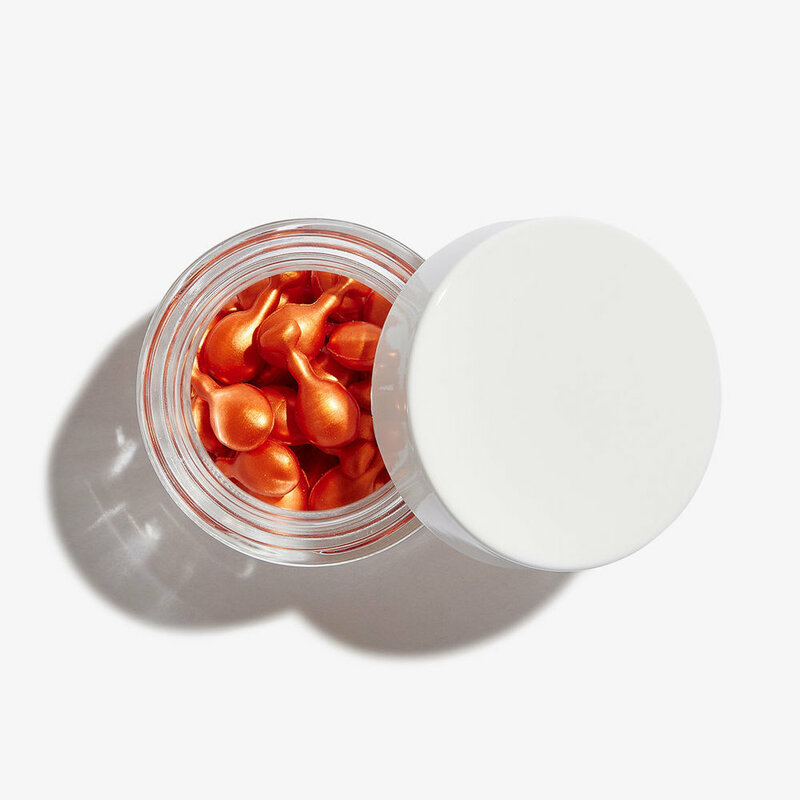 Simply twist off the end of the capsule and then apply a tiny amount to your fingertip and then apply to cleansed skin on your neck area & entire face. This one can be used before bedtime or when you get up in the a.m.- however, with Summer around the corner and more daylight exposure likely for many of us, I would recommend you apply this product at night & before bed and keep exposure to a minimum during treatment time as products containing Vitamin C can cause irritation & other skin issues for some users (if applied prior to prolonged sun exposure). I did not experience any of these issues thus far while using this awesome product, but as someone with sensitive skin I advise on applying this one at night if you feel your skin might fall into that profile. What’s great about this product, is that having used it myself- I can recommend it for those with a variety of skin concerns & types- such as for fighting the signs of aging, like reducing wrinkles & firming the skin… to improving skin discoloration & texture too!